Every FCEB put into service in the U.S. could reduce the carbon released into the atmosphere by 100 tons annually and eliminate the need for 9,000 gallons of fuel every year over the life of the vehicle. For buses running on diesel fuel, that translates into a savings of more than $37,000 per year, per vehicle. Fuel cell buses operate with no local emissions, reduced noise, and a substantial reduction in greenhouse gas emissions on a well-to-wheel basis and have performance, range and route flexibility similar to diesel buses. FCEB technology in California is currently at Technology Readiness Level 7 or “full-scale validation in relevant environments.” Level 9 is a fully commercial product. FCEBs are approaching a cost of $1 million per bus. See the Advanced Clean Transit page and the International Fuel Cell Bus Collaborative website. AC Transit is on the road to a cleaner, quieter future. 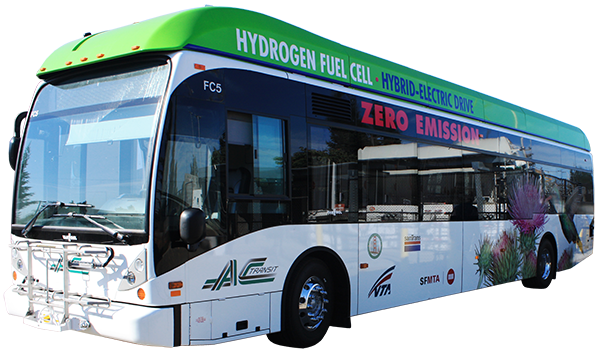 With 13 fuel cell electric buses on the road and two hydrogen stations, AC Transit has the most comprehensive fuel cell program in North America. AC Transit’s FCEBs have driven more than 1.3 million miles and carried 5 million passengers in the Bay Area. AC Transit is adding 10 more fuel cell buses in 2018. In 1994, SunLine switched from diesel to CNG overnight—the first public transit agency to have all alternative fuel vehicles. In 2000, SunLine began operating a fuel cell bus and opened the world's first transit hydrogen station. Now operating five FCEBs in regular service, SunLine is adding 12 fuel cell transit buses and two shuttle buses by the end of 2018, and is upgrading its hydrogen station. 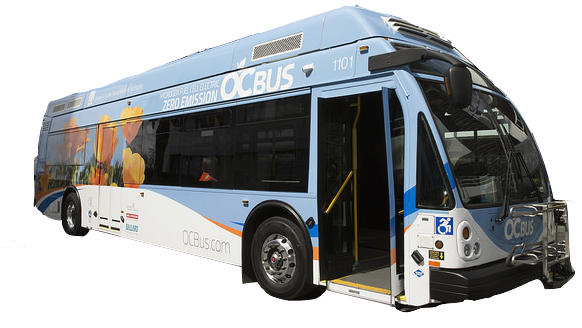 OCTA added its first fuel cell bus to the fleet in the summer of 2016, and has plans to deploy 10 additional buses with supporting fueling infrastructure in the near future. During the two-year pilot program, OCTA plans to operate the first bus on a variety of routes for about 16 hours per day, 292 days a year—the same schedule as other buses in their fleet. Transitioning today’s trucks from mostly diesel to zero-emission technology can significantly reduce the negative environmental impacts of freight transport. 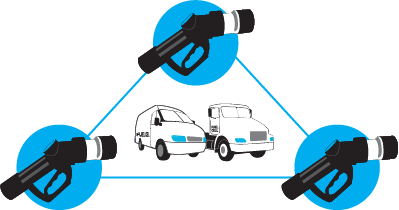 CaFCP’s Medium- and Heavy-Duty Fuel Cell Electric Truck Action Plan for California makes recommendations to advance and incentivize FCETs and hydrogen infrastructure. In California, vehicles are the leading contributors of air pollution and greenhouse gas emissions, and, medium- and heavy-duty vehicles are one of fastest-growing sources of emissions and energy consumption. 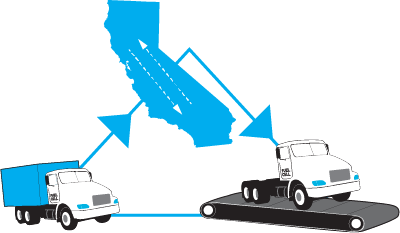 In July 2016, the California Sustainable Freight Action Plan was published. Its aim is to improve freight efficiency, transition to zero emission technologies, and increase competitiveness of California’s freight system. Although truck manufacturers have been investing in electrification to increase fuel economy, no truck manufacturer has plans to build commercial fuel cell trucks. The Action Plan makes recommendations for steps that government and industry should take between now and 2020 to establish a foundation for fuel cell truck development, and leads to continued market investments. If enacted in a timely fashion, CaFCP expects to see FCETs entering the early commercial market by 2031. 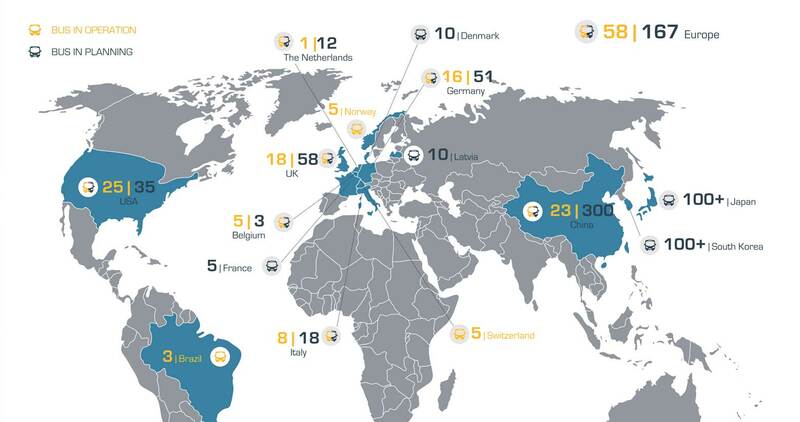 By 2050, product planning by truck OEMs and hydrogen infrastructure can be fully commercialized in all truck vocations for which a business case exists. Focus near-term efforts on medium-duty “last-mile” delivery trucks and heavy-duty drayage trucks to focus on cost and technology advancement. A consistent set of collected data variables for comparison, feasibility assessments, and decision making. Planning for hydrogen infrastructure needs to begin immediately. The Action Plan advocates funding one or two heavy-duty hydrogen stations that can serve multiple demonstration projects in a region. Fuel cell bus stations provide a wealth of lessons learned for implementation and operation of hydrogen stations for trucks. 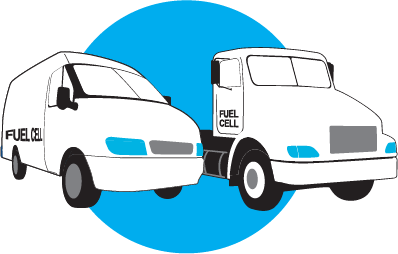 11 California fuel cell truck projects are under development, none of which include permanent infrastructure. Successful demonstrations of these trucks, as well as deploying fuel cell bus Centers of Excellence, will inform major truck manufacturers about the feasibility of fuel cell technology.